The last section of the Bois Brule is beautiful and lively, much like previous segments, but what makes this paddle extra special is what lies at the end of the river – the Lake Superior delta. We recommend this level. Wisconsin Trail Guide provides a very useful chart that categorizes water levels for each section on the Bois Brule. 125-200 is the lowest you’d be able to paddle (although, expect some scrapping at the low end). The levels we paddled at were great and gave us no notable difficulty at 142 cfs. Time: Put in at 12:20p. Out at 4:00p. Wildlife: Mergansers, eagles, heron, two turtles, trout and a birthday balloon (birthday balloon not technically life but it sure was wild). Three sections of the Brule were behind us. The first, a buffet of sorts, offered a variety of paddling personalities, the second was lazy and pleasant, and the third was our favorite, (perhaps ever) treating us to near continuous riffles and exciting rapids. Coming down from the high that was the day before, that being the phenomenal whitewater, we were excited to complete the Brule. We were now met with the final stretch, sure to be unique if for no other reason than we’d be taking-out on the beaches of Lake Superior. And that’s the shorthand for this paddle – plenty of riffles, Class I rapids and cut red clay banks (which are now a bit taller) but the appeal to this trip is where you’ll end up and all that may be in-store when arriving at one of the greatest lakes. The final stretch is a good eight miles to Lake Superior. It’s mostly riffles and easy Class I rapids with a few more sections of quieter water, (which is better for frisbee, I suppose) perfectly suited for canoers and kayakers of any skill level, specifically those with an interest in light rapids. It was a little bony at times but mostly fine at these levels – and definitely no walking of the boats. The put-in at Highway 13 is a convenient access point, equipped with facilities but there is little parking. 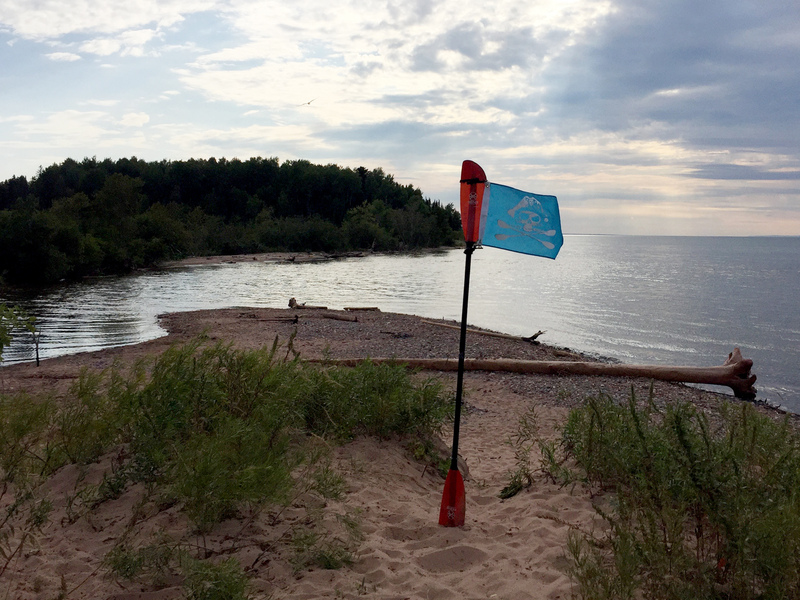 This landing is a busy one because it’s not only the put-in for the popular journey downstream to Lake Superior but it’s also the take-out for the popular whitewater section just upstream. Picking up the fun where we left it from the upstream segment, there’s immediately plenty of easy and gentle riffles leading to the Highway 13 bridge. When things quiet down between on-again-off-again riffles, you’ll start to notice that the water has now turned from clear to silty and eventually opaque, especially in the last mile where the river gets much deeper on its approach to the big lake. A few miles into the trip, you’ll come to a mandatory portage – the sea lamprey barrier/dam, which was deemed neccessary to protect this pristine river and its population of trout. It’s clearly marked and the portage is relatively short and easy. After the portage, there’s plenty more riffles, gentle bends and some boulder gardens to navigate for the next five miles. Moments when things got quieter between the riffles beds, we had more wildlife encounters than we did on the upstream paddles. There were mergansers, eagles, heron, a couple turtles and of course, some trout. The river goes slack almost instantly after Weir Riffles, the last set, just one mile from Lake Superior. The water gets deeper and soon you’ll lose the once decipherable bottom. Eventually, the river widens and soon, there’s a change in scenery on the banks surrounding. There’s the sight of an eclectic-looking cabin, and the noise of Superior dwellers in the distance. Soon, the sandbar appears in the distance and you’ll spot the opening to the big lake. Today, the waves were thankfully pretty tame so we paddled furiously toward the opening. Despite the obvious result of bigger waters bobbing your boat up and down, you’ll instantly notice the color and strength of the lake’s pull when you’ve crossed that barrier from river to Lake. Magical? Maybe not. But peaceful and just hella cool? Absolutely. Some of us stayed out in the big water, soaking up the moment. Others, like myself, headed back in – just as excited to see everyone out in the glow of the overcast sky as I was to be part of it. The take-out – well, it’s everywhere. It’s all beach and a short drive from the parking lot to loading dock. But before loading up one last time, it was sandbar time. The only missing was a Mojito or Piña Colada (note to self: bring colada mix next time). But colada or not, the Bois Brule River is so uniquely defined, section after section, that to have it end in such a magnificent setting is beyond the cherry on top. The last night of our multi-night group trips always includes an outing to a local establishment instead of cooking fireside. This year, it was just down the road despite Yelp recommending the Kro Bar. (Barry too, where he had a mean Philly Cheese Steak the first night he arrived in Brule). But nope, we ended up at the Hungry Trout Inn – perfect for those on a budget (of money and hunger – they would only cook us pizza). But ironically, the most expensive thing in the bar was the jukebox which cost $1 a song, (as if sponsored by iTunes, except you don’t own the song – you can only hear it). It made me consider playing the longest songs I could think of just to get my money’s worth (I could handle Mountain Jam but I’m not sure I could stomach the obnoxiously long Thick as a Brick – or Tull in general). The Hungry Trout is the definition of a dive bar – but again, it’s within walking distance of the Copper Range Campground. And as one would expect, there were a cast of characters to add some color, including the amazingly candid bartender, the eagle-eye owner (who apparently is a witch?) and Dan, a guy just biding his time because he was sure the northern lights would be in full effect as they had been on the previous night (Dan, you had my hopes up). Coincidentally, what’s even more interesting – and ironic – and something that wasn’t known to me until I returned home the next day, was that my neighbor from back in Madison not only happened to be in that same bar, but was staying at the same campground and had canoed the Brule that weekend too. We had just crossed paths inside the bar (him on his way out while we were heading in). While he was unpacking his canoe and saw me unpacking my kayak and gear, he must have put two and two together and came over. He asked if I happened to be up on the Bois Brule, specifically at the bar near the campground… and sure enough, coincidence indeed! He thought I looked familiar but couldn’t place me so he didn’t say hello (which I completely get when you see someone out of context). Strange though, right? Having absolutely nothing to do with the paddle, what was most disappointing was my Bois Brule weekend sendoff. With a serious storm moving in and many in our party feeling the effects of some stiff drinks from the Trout, the communal fire was extinguished. I stumbled back to my campsite for an afterbar for those who stayed up. 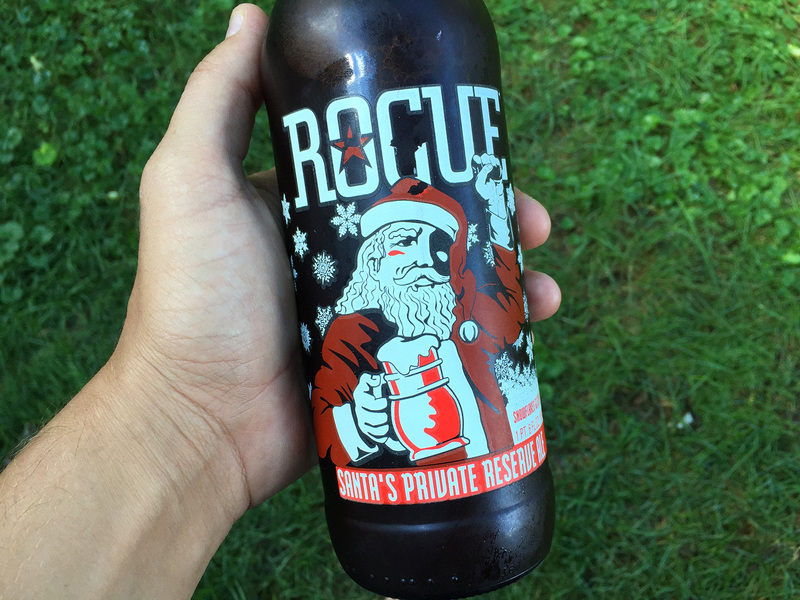 In keeping with my “save the best beer for last” tradition, I had Santa’s Private Reserve set aside – a “Christmas in September” if you will, to celebrate the last moments of a special weekend. But I came back to find only two birch twigs. The last few pieces of split wood I had preserved for my ritual sendoff were stolen. Stolen? Or maybe mistakenly taken by Sasquatch? Stealing wood is pretty sad, considering we were surrounded by it, right? This though, I had paid for. So it was a little upsetting – and unnerving – that someone came into my site to take it. I normally like to assume that I’m in the company of like-minded and good-natured people when I’m camping, but maybe I’m being a little naive. I’m hoping it was an honest mistake (but you have to wonder). So I sat in the dark on the picnic table, watching the amazing flashes of lightning light up the sky, listening to the ever-nearing rumble of thunder make its way toward us, and reflected on the last few days of great paddling (and enjoying the last moments in one of the best campsites I’ve ever stayed in). It was beautiful. I just missed that sizzle of rain drops putting the nail in the coffin of that weekend. Also, for a guy who has spent many nights up north, I have yet to see the northern lights. While I certainly can’t expect to see them, apparently we missed them two of the four nights we were there. I was so close! Oh well, again, maybe next time. We would certainly do this again (after the whitewater section of course). This was one of our three favorite sections on the Brule but they are each a worthy paddle for one reason or another. Yet this one, well, there’s a special feeling, moving from a river as beautiful as the Bois Brule to something as majestic and grand as Lake Superior. The shuttle, while doable, would not be ideal to bike. Half of the shuttle is spent on Brule River Road which is an undeveloped dusty gravel road that leads to the mouth/take-out. In fact, on a bicycle this would be frustrating to the point of miserable, maybe not even doable (depending on the tires/style of bike). Even in a car you’d slide a little one way or another. And if you’re behind another car, all you’ll be doing is seeing and breathing in dust for the next 10 minutes or so. Coincidentally, much like his boat, Timothy’s car suffered a flat tire from the drive – no kidding (fortunately, it was a slow leak and could be limped to the nearest gas station for air, then driven successfully back to Madison five hours south). Another shuttle option? It would be best to catch a ride from one of the many groups that may be shuttling (we shuttled two different people ourselves). The put-in at the Highway 13 Landing. … and the riffles begin. We helped this guy, Ben, with a shuttle. Don’t cry for Ben, he’s doing alright. The first outcrop of the trip. Putting-in after a short shuttle. The first sign of the coming fall? The first turtle caught on camera. One of a few class Is. There are more boulder gardens in this section than in all the others. The last obstacle before the straightaway to Superior. Timothy #winning the race to the Big Show. The rest of the group making their way. The Bois Brule Seven (well, six actually – someone had to take the picture). Interesting that it doesn’t say “Bois Brule”, no?